This baked ham recipe features a honey and brown sugar glaze with bourbon and orange juice—better than store-bought and half the price! You don’t have to buy a ready-prepared honey-baked ham to please your guests because you can make an awesome ham at home for half the price. 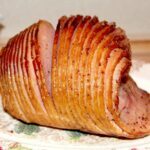 This Baked Ham recipe is one of our favorites and is usually always on the table for holiday or large family gatherings. Don’t limit serving baked ham to just Thanksgiving—it’s a great picnic choice or just a dinner at home in the middle of summer! And the best part is you’ll always have some leftover for the best ham sandwich! I like to serve this baked ham with roasted potatoes, cole slaw, or macaroni and cheese. 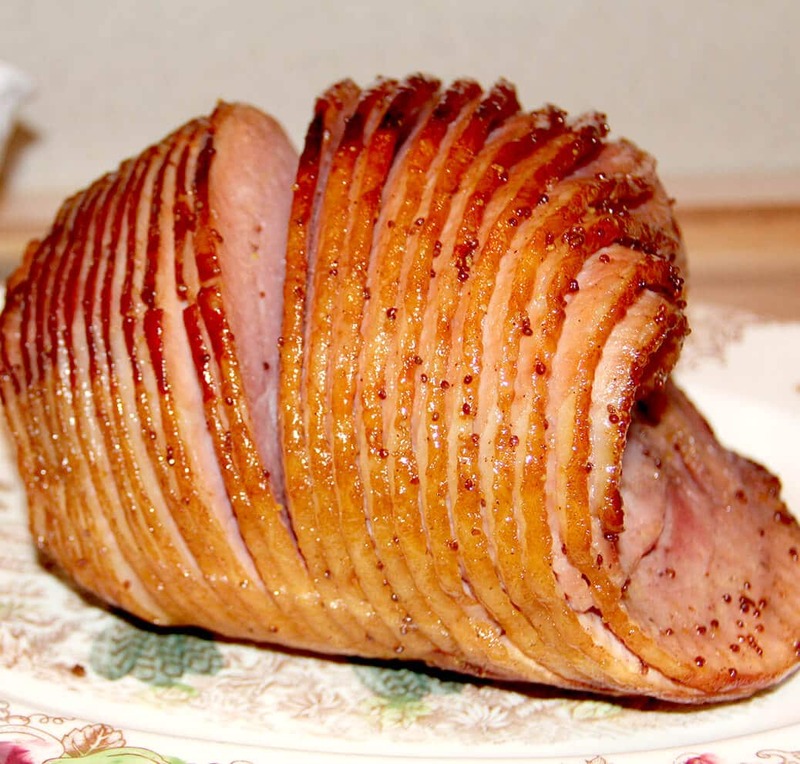 You’ll need a large roasting pan to bake the ham in, something like this one would be perfect. And of course you need a pretty platter to serve your ham on. If you don’t have one, I love this one by Spode! Preheat oven to 325°. Discard the glaze packet that comes with the ham. Cover the ham with foil and place on a rack in a roasting pan. **Cook’s Tip: Add water or apple juice to the pan to keep it from drying out. Bake ham for about an hour and then remove and pour out most of the liquid from the bottom of the pan. **Cook’s Tip: Leave a little of the liquid and the glaze will drip down and mix into it. While ham is baking, make the glaze. Whisk together brown sugar, honey, Dijon mustard, bourbon, cloves, and orange juice until well blended. 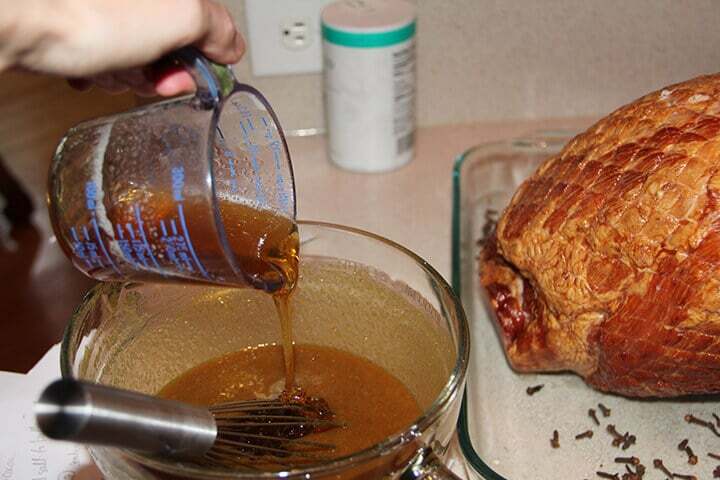 Pour the glaze over the top of the baked ham. 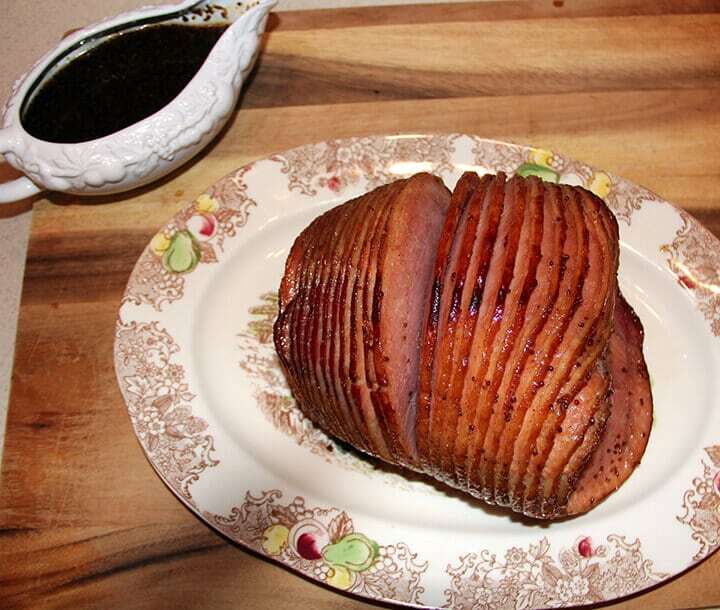 **Cook’s Tip: Be sure you separate the ham slices a little to get the glaze down in there. Then just pop the baked ham back in the oven for about 45 minutes. Baste with glaze every 10-15 minutes. Serve with the leftover glaze on the side. So easy and so delicious! Wrap ham securely in tin foil and place on a rack in a roasting pan. Add apple juice or water to bottom of pan to keep it from drying out. Whisk together all glaze ingredients until smooth and blended. Bake ham for 1 hr to 1 hr 15 mins. and remove from oven. Remove foil and pour out a good bit of the liquid from the pan. Pour glaze over ham, using pastry brush to get glaze down in between slices and cover the whole ham really well. Place ham uncovered in oven for 30-45 minutes. Baste every 10 minutes. Serve with the glaze/liquid mix spooned over the slices. Add water or apple juice to the pan to keep the ham from drying out. Pour off some of the liquid before adding the glaze, but leave a little of the liquid and the glaze will drip down and mix into it. Be sure you separate the ham slices a little to get the glaze down in there. 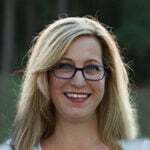 Update Notes: This post was originally published October 3, 2012, and on October 8, 2018, was updated with one or more of the following: step-by-step photos, video, updated recipe, new tips.